Tripp Lite's B096-048 is the most advanced console server platform available today. In one secure appliance, it offers an in-band and out-of-band management solution for serial console ports, servers, virtual servers, service processors, UPS and PDU's, environmental monitoring and more. 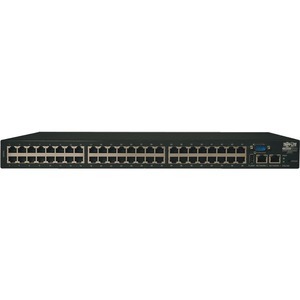 This 48 port console server management switch enables system administrators to securely access and control their data centers and networks from anywhere in the world. And this enterprise level unit is equipped with a built in modem, dual Ethernet, dual AC power, 2 gigs USB flash and runs on Linux for scalability and reduced downtime. The B096-048 offers advanced software features that surpass the requirements of even the most demanding applications. These features include Network UPS Tools for UPS monitoring, PowerMan for integrated PDU and RPS functions within session hotkey support, Pattern match alerting, open access to the Linux shell for scripting, heartbeat monitoring with automatic failover, Cisco pinouts and much more. Available in 16 and 48 port models, the B096 family of Console Servers are the perfect fit for in or out of band access to vital IT assets.